Above: Virginia CTT Class this weekend. Day 1 on the Square Range. After running a Combat Team Tactics (CTT) class this weekend, I wanted to put this information out there. The reason being that there is plenty of talk out there about ‘training,’ but unless you are incorporating professional live fire training into your overall training plan, you will probably not understand, in a practical sense, what I am about to discuss. In the same way that it is easy to talk about ‘shoot, move and communicate’ on the internet, but harder to actually conduct for real. You need to be building real operant conditioning via the right training. What I am going to talk about, namely buddy awareness and scanning, seems so simple. However, on training classes we spend a deal of time drilling this into people, and first drilling bad habits out of them. Unfortunately some of these bad habits come from individual focused training on basic shooting and weapons manipulation on the square range. When it’s all about ‘driving your AR’ and your INDIVIDUAL shooting skills, scans can become notional, robotic. This is one of the chief problems with training when it never makes it off the square range: it is an individual sport, not a team activity. This causes big problems when trying to operate as a team in a live fire environment. Great post. Can’t be overstated how hard it is to put all components of fire and movement together. Look forward to next visit to WV to work on spacing, bound length, communication, muzzle control, scanning(among other things); there are alot of components. If you have a team together I would encourage you to attend training as a team. See you in December! Yes, VERY good food for thought! This was one of the big lessons-learned I took away from CTT/Mobility. The fact that I had sent SO many rounds downrange in training courses, competitions, and practice sessions as an [b]individual[/b] had given me tunnel vision that I didn’t even know I had. As the course progressed, my situational awareness expanded, so that it was almost like my vision was expanding. And that goes hand in hand with the weapons-handling and active muzzle awareness. By the “bolts out” comment do you mean dry runs have much less utility in training than live fire? Dry runs / rehearsals are a part of training towards live fire. To only go so far as dry runs lacks utility, and does not achieve the correct training effect. In fact, if you stated that you were going to run a couple of hours of ‘break contact drills’ with ‘bolts out’ then you would be leaving students feeling they knew what they were doing, but actually blissfully unaware of what they need to know, the training they need to do, to have a chance of actually carrying it out under enemy fire. I remember being coached on this at CRCD. Pulling your head off of your stock and visually identifying your buddy’s location has two benefits: breaking your tunnel vision, knowing where your buddy is, and helping him hear your communication. If you just yell straight forward, amid the shooting, huffing and puffing, and earpro, they won’t hear you. You have to actually yell directly at them. This is case in point for the necessity of training that progresses beyond the square range. 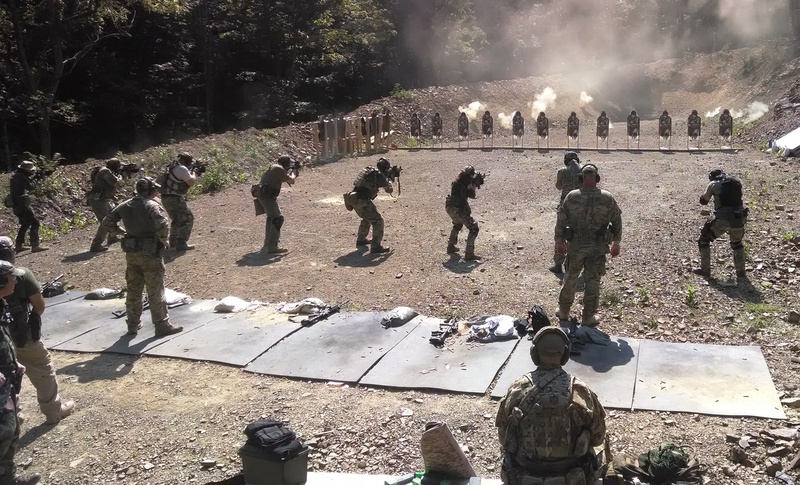 Having an instructor yell “threat” does not come close to having to tell your team to get online, telling someone to move, telling someone you are changing mags, etc…while shooting, running and going prone and getting up again. It’s pretty much the ultimate multitasking. The only way to get better at it? Practice practice practice…the best place to practice? MVT. Cannot be over-stated, thus stuff has to be run live-fire to get the full affect of learning how to fight with friends. “Pulling your head off yer stock”. That is important. I would add that a RDS helps in this regard, by keeping your head slightly higher on the stock, with both eyes open. This significantly helps your situational awareness. Then, with a -14, your head is up even higher, which helps out tremendously in no/low-light. So yeah, this is progressing past BRM, with your face squeezed tightly into the stock and your entire focus on the front sight. Oh ya, I remember this one. Right before a training exercise Max was encouraging us to be more “aggressive.” To show I was actually listening I took it to heart and when me and my battle buddy started the assault my effort was focused on being aggressive and hitting the target. Notice I left something out? Well about half way to the target I hear Max screaming “STOP!!! STOP!!! STOP!! !” As it turns out my battle buddy was so far back it was getting dangerous so Max stepped in to make sure my dumbass didn’t get shot. By the way, I don’t think a thank you was offered so thanks Max. Yes I looked around from then on to check where everyone was located but I didn’t attempt any more jokes about being “too aggressive.” After all I hated wasting time getting stared at.